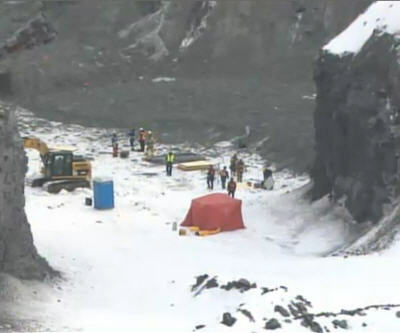 Both missing workers from Tuesday's avalanche inside a Quebec quarry pit have been recovered. Marie-Claude Laporte's body was located on Saturday evening. Earlier in the day the remains of Daniel Brisebois was found. The gravel pit, operated by Maskimo Construction and Excavations G. Allard, is located in L'Épiphanie, Que. The province's workplace safety authorities will be investigating the incident. Rescue staff had been searching for the workers since early this week when the vehicle being driven by the workers was buried by an avalanche of loose gravel, carrying the truck to the bottom of the pit. One of the survivors, Benoît Robert, who avoided Tuesday's avalanche told CBC that his employers are caring and would have not have purposely endangered the lives of the employees. Here is raw video of day five of the search from CBC News.